Hi all, here is a picture of these things. I have one on each window in front of my Marine Trader Labelle 43. The port one is on the top center of the window. 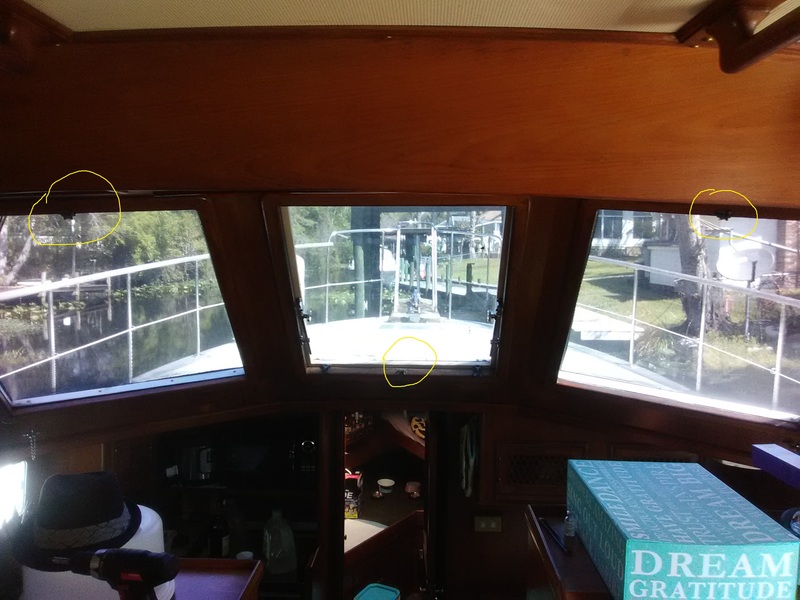 The middle one is on the bottom center of the window and the starboard one is top center of the window. they are some kind of pully. what are these and how were these used? 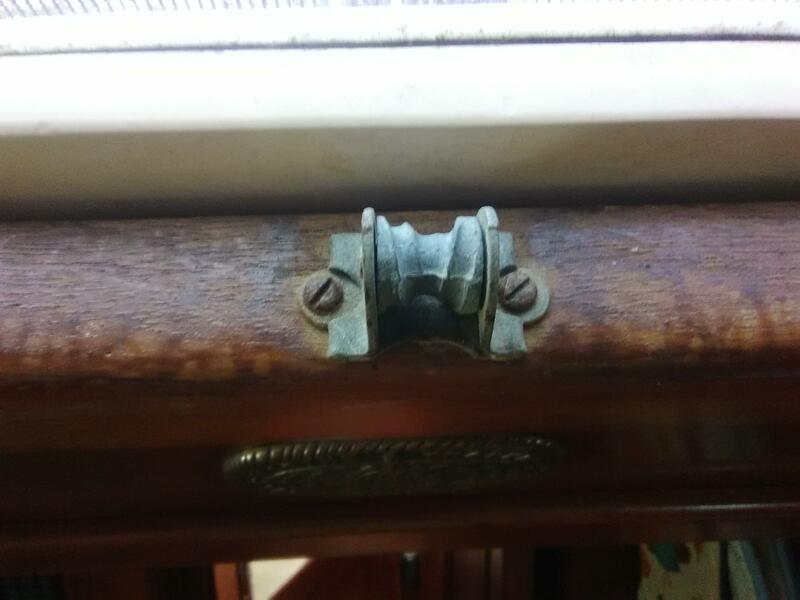 Window shade pulls? Any other signs of attachments around the windows? How about a shot of the whole window, or windows? I was thinking that they maybe were, but obviously a lot was removed because there are no rails or guides for the shade and no apparent holes where the shades were. Also, the funny thing is how the port and starboard are at the top and the center is at the bottom of the window. I will work on getting a full pic. I would at least clean and grease them up so they rotate well. The thingy is a rope cleate. Would need a bigger picture to understand purpose. OK, thanks to tilrider1 we know the etymology of the thingy! And BTW they do roll quite well. Question is still the usage, I have placed a bigger picture in this thread. I was thinking it was some elaborate shade system which has had components removed, but alas no evidence of said components exists.... Thanks! They might have been offset that way to make it easier to grab the cord that ran through them, or something to that effect? The center one might also have been to allow partially pulling down the shade while having the window open? If there's one thing I know about boat work, never over-estimate the thoroughness of previous work. What got changed/removed/re-varnished in the past might have nothing to do with how it looks today. Somebody could have replaced the other pieces and the work order didn't mention removing those, or something to that effect. The larger view pic explains it... center window tilts open from bottom so pulley arrangement allows partial shade/ privacy while allowing ventilation. Side windows fixed so running the other direction OK.
Those are shade cord stops. They work because the helical track coming from the center towards both ends is tapered in diameter, getting larger as it goes. The cord catches one of the tracks, is run outboard until the increasing diameter jams the cord. It's quite a clever and reliable design. Common on old wood commercial fishing boats and tugs with windows that opened by sliding down in the wall, the cleats were to hold the window at a specific place. Window frame and sill were made so the window locked in place and kept water out in anything less than a submergence. Wow, thanks for all the answers, I do appreciate all the information given. Now if I can just find the components to restore it back to original function. Love my boat, and love finding out about these interesting "features". Thanks Yall.